Coming off a three-game winning streak, the Golden Knights traveled to Sherman Oaks to face Notre Dame before facing the toughest part of their schedule. A win would give the Golden Knights a chance for second place during the following game against Chaminade. Not caught looking ahead, senior forward Eric Verso cut through the Knights’s defense to rack up the first individual four-goal game of the season for St. Francis. As if a hat trick wasn’t impressive enough, Verso energized the sidelines and wowed the crowd with an impressive quasi-bicycle kick to stretch the lead before the game’s end. His performance was an affirmation of his talents displayed in 2009 before suffering a knee injury at the beginning of this season. Heading into the game, neither Chaminade nor St. Francis had a shot at finishing above Loyola for first place in the Mission League, but the matchup was crucial in determining second place and the prospects for the playoffs. 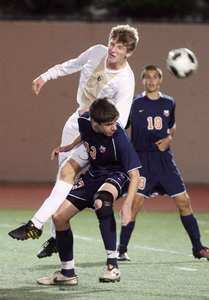 An Austin Frank goal was all that was needed for the Golden Knights to achieve second place in league play. The junior midfielder zipped through and open lane and put the ball in the net in the 38th minute. Ball possession and a stout defense that allowed only six shots gave the Golden Knights a quality victory over a tough opponent as they looked forward to their most anticipated match of the season. On paper, the Golden Knights’s season finale against Loyola wasn’t very important. An impressive win may have given St. Francis a better position in the playoffs, but by the time the Cubs arrived at Friedman Field on Friday they had already clinched first place and held an undefeated league record. The less celebrated but more recently decorated Golden Knights could do nothing but look up from their position as second best team in the Mission League. There were arguably many more important endeavors this season, especially the previous game at Chaminade, but it would be unwise to tell that to the spirited crowd that watched two rivals go at it for pride. The atmosphere on Wednesday felt like a Friday night in the fall, but with less pageantry and more fans actually following the game. By the end of the school day, fans wearing Loyola and St. Francis sweatshirts alike trickled in from the courtyard and down to the field in what was by far the best attended game of the season. A Mark Verso goal in the 15th minute tied the game at one, but Loyola forward Andre Brown untied the game in the 22nd minute as the game entered the half at 2-1. The beginning of the second half seemed like a nightmare for the Golden Knights as they allowed two goals in a span of one minute to create a seemingly insurmountable lead for the Cubs. Senior forward Eric Verso continued his impressive goal streak by breaking through in the 66th minute to bring the score to 4-2. Sophomore forward Mark Verso’s shot was deflected off the arm of a Loyola defender, and brother Eric calmly put away the penalty shot to bring the Golden Knights to within one in the 74th minute. St. Francis mustered one more shot in the final six minutes of play but eventually fell in heartbreaking fashion once again to the Cubs. The loss snaps a five game winning streak heading into the playoffs, but St. Francis looks to take a banged-up but battle-tested team to the CIF finals once again. The first round of the playoffs begin on Friday. St. Francis limped into Monday’s contest against Harvard-Westlake with a two-game losing streak looking to take back control in the Mission League race. After two straight late losses, the Golden Knights produced some second-half success of their own to defeat the Wolverines at Friedman Field on Monday night. Sophomore forward Mark Verso led the way with three goals, and it wouldn’t be his only hat trick of the week. His final goal in the second half put the Golden Knights on top for good and extinguished a two game losing streak. Coming off an exciting home win, St. Francis hosted Crespi two days later looking to create a winning streak and some separation in the Mission League standings. 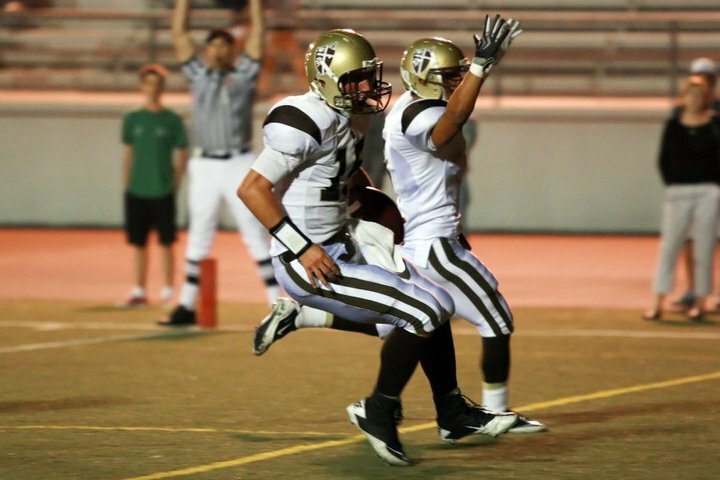 After a series of tough games, the Golden Knights shellacked an overwhelmed Crespi team. Senior forward Christian Swart tacked on two goals, including one off a beautiful cross from senior midfielder Connor Snashall. Junior Billy McCreary got into the action with a goal and sophomore forward Mark Verso continued an impressive scoring streak by adding one of his own. After home wins against Harvard-Westlake and Crespi reversed a two-game losing streak, the Golden Knights went on the road to Mission Hills to face Bishop Alemany. Behind another hat trick by sophomore forward Mark Verso, St. Francis stormed out to an early lead and never let up to grab their third straight win. All three of Verso’s goals were scored in the first half, and a goal by junior Billy McCreary set the score at 4-0 before the halftime whistle was blown. Verso’s performance was a step up from his previous game against Alemany in which he scored two goals behind St. Francis’s 3-0 win in their Mission League home opener. Behind a three-game winning streak, the Golden Knights now have a 7-2 league record with the season winding down. St. Francis has a good chance of finishing on top in the Mission League but faces the toughest part of their league schedule to close out the season. The Golden Knights head to Sherman Oaks on Friday to face Notre Dame, followed by a Monday night game at Chaminade before the regular season finale at home against Loyola. Taking an undefeated league record into Friedman Field on Thursday, the Golden Knights dropped a heartbreaker to Chaminade for their first league loss of the season. A first half goal put the Eagles ahead in the 24th minute, but a deflected header from a midfield free kick was headed into the back of the net for the equalizer by Billy McCreary in the 65th minute. St. Francis looked to rack up another late comeback win, but a wide open Nick Barbarino sent it home in injury time to give the Eagles the victory. The Golden Knights suffered their first league loss despite taking three times as many shots as the Eagles. Coming off a home loss, the Golden Knights traveled to Loyola on Saturday looking to steal a win from their archrivals. After grueling stalemate, an extra time penalty kick by Loyola forward Justin Jenkins gave the Cubs the win. Loyola took an early lead on a Willie Aviso goal in the 7th minute, but a Mark Verso header in the 52nd minute evened the score. Unlike St. Francis’s previous game against Chaminade, this game seemed to be an even match with either team deserving the win. St. Francis had a couple chances to go ahead down the stretch but couldn’t convert against the stingy Loyola defense. The loss gives the Golden Knights a 4-2 league record midway through the Mission League season and an 8-8 record overall. St. Francis plays again at home on Monday against Harvard-Westlake at 5. A spirited crowd arrived at Friedman Field Tuesday night to watch the Golden Knights open their season against the Crescenta Valley Falcons in the soccer edition of the Battle of the Boulevard. Behind a hat trick by striker Pavle Atanackovic, the Falcons were able to take down St. Francis by a score of 3-1. A diving save by St. Francis senior keeper Hector Carranza in the 31st minute brought life to a rather uneventful first half, but a well-placed corner kick provided Atanackovic with his first goal of the night only moments after. The second half provided more excitement as Atanackovic struck for a second goal in the 45th minute. His hat trick fell befittingly from his head as Carranza could do nothing but watch the ball sail into the back of the net only five minutes later. “We played better than the score showed, but they took advantage of our defensive mistakes,” said Coach Appels on Wednesday. A scuffle in the 56th minute that lead to a misplayed red card (eventually downgraded to a yellow) sent the Golden Knights on the attack. Sophomore forward Mark Verso would get an easy goal in the 62nd minute that sent the Falcons on the defense, but it was too little too late as Crescenta Valley handed the Golden Knights their first loss of the season. On Friday night, St. Francis hoped to rebound from their opening loss, but faced a tough task against the Santa Barbara Dons. The Dons entered the season having won 31 of their previous 33 matches and notching a nearly undefeated season the year before. After taking a 2-1 halftime lead, the Golden Knights held on to win 3-2 for their first victory of the season. A couple days after suffering a loss thanks to a hat trick at the hands of the Falcons, sophomore forward Mark Verso responded with a hat trick of his own. The 1-1 Golden Knights play again Monday at West Torrance before beginning the College Cup Tournament in Santa Barbara. 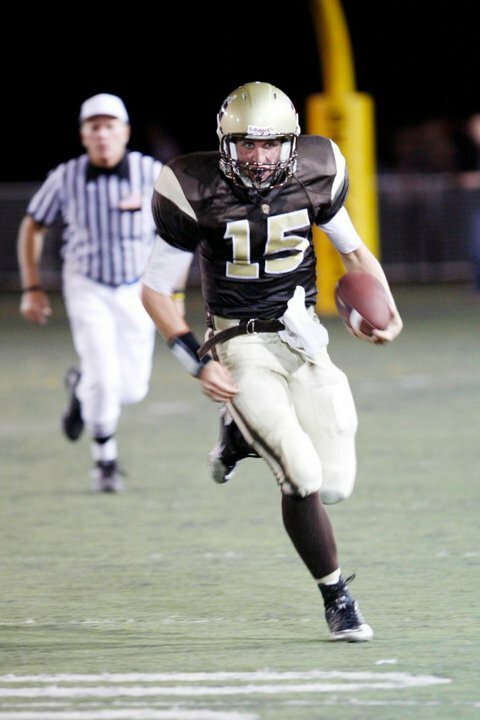 The 2010 St. Francis football season ended Friday night at Dominguez Hills High School. A last minute push by the Golden Knights fell short of capping off a dramatic game-long comeback. If the outcome had been different, I would have delved into the size and speed advantages of the Dons or laud over the grit and determination of the Golden Knights. Only one thing needs to be known, however: the Knights were good, but the Dons were better. An analysis of the game isn’t necessary, especially since I have more important things to say about this season. This varsity team achieved so much more than their 6-5 record shows. Their admirable effort with their backs up against the wall multiple times this season should be praised more than any victory achieved. This season has made a fan out of me. I am a fan of Coach Jim Bonds. He isn’t a man who commands respect but earns it from each and every one of his players. There are many admirable teachers, workers, and men on campus, but I have heard so few of them being referred to as a “father figure” or “mentor” as Coach Bonds has. He understands football inside and out but also takes the time to get to know and protect his players. When he tells his team that everything they do is to glorify God and the greatest game ever invented, I have no reason not to believe him. I am a Brett Nelson fan. I am an Ian Sternau fan. I am a fan of Brian Basic, Keith Enterante, Julian Vischer, Andrew Quintero, and if I had the space I would list out every senior who dressed up Friday night for the last time in a high-school uniform. For the longest time I disliked football players for their size, cockiness, and carefree attitudes, but this senior class is truly different. I am proud to say that I walked the sidelines and hallways with a group of talented and respectable young men and it is an honor to call them my classmates. 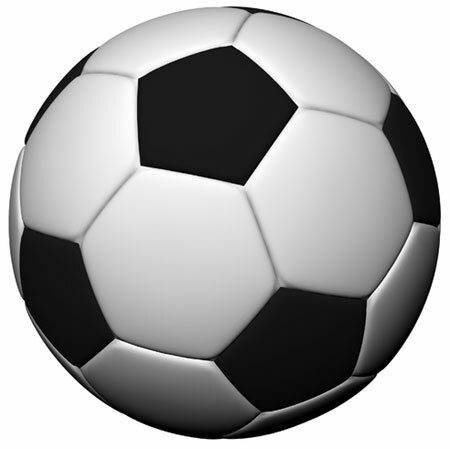 Lastly, but probably most importantly, I am now a fan of football. I have always enjoyed the game, but scandals involving greed and corruption at the college level and the corporate monster that is the NFL had turned me off to America’s most popular sport. I have since had a change of heart. When I see the Golden Knights take the field, I see players playing simply because they love the game. I see athletes hitting each other to protect the teammates they call brothers. I feel a sense of passion, community, joy, and pride like no other from these players when they play under the lights. So much effort goes into making sure a season of football is played, but it is done because we take so much more out of it. For many seniors, Friday night was the final game of organized football they are ever going to play. For me, it might have been the last football game I’ll ever watch at St. Francis. I bid good luck to all those who will play in college next year and to next year’s varsity team, who has some enormous shoes to fill. This year’s team may have not reached its goal, but I applaud them anyway for bringing the spirit and respect this program has. The last couple years have been fun and we’ll always have the memories. But most importantly, we beat Loyola. Go Knights. In preparation for his halftime speech, St. Francis coach Jim Bonds encountered a word written in big letters while erasing the whiteboard: FINISH. “I like that,” he said, and the word was left up. The Golden Knights finished their final home game with a flourish, overcoming a disappointing first half to blow out the visiting Swordsmen. Coming off a four-game losing streak, it was imperative for St. Francis to win to stay alive in the Mission League race. The St. Francis defense came out dominating in the first half and remained strong all the way through allowing St. Paul only 139 yards of total offense. St. Francis fullback Luke Anderson started the scoring with a touchdown scamper in the first quarter, but an Ian Sternau field goal was all the Golden Knights could muster before halftime. The offense missed a couple scoring opportunities in the second quarter, including a blown third down play deep in Swordsmen territory that sent the Golden Knights into halftime with a 10-3 lead. The last few weeks have been especially difficult for the Golden Knights as they struggled to finish off opponents with last minute drives, but after the halftime homecoming festivities, they made sure it wouldn’t happen again. Quarterback Brett Nelson connected with receiver Travis Talianko for a 14 yard touchdown pass that raised the spirits of the anxious homecoming crowd. Pinned deep into St. Paul territory, Nelson’s pass that was tipped into the hands of receiver Ian Hamilton led to a 69 yard touchdown. It wouldn’t be the last highlight-reel play from the receiver. A reverse from running back Austin De Los Santos to Hamilton appeared to be broken by the blitzing St. Paul defense, but Hamilton lofted the ball to a wide open Talianko in the front corner of the end zone to give Hamilton both a passing and receiving touchdown on the night. Defensive end Michael Singelyn would recover a fumble that essentially iced the game and sent in the reserves. True to his word, running back Matt Raba was, indeed, ready for the game as the go-to weapon on the Golden Knights’s final drive of the game. The win for the Golden Knights gives them an overall record of 4-4 and a divisional record of 1-2, still in the race for a playoff spot. St. Francis goes on the road to Cathedral High School in Los Angeles next Friday at 7:30. 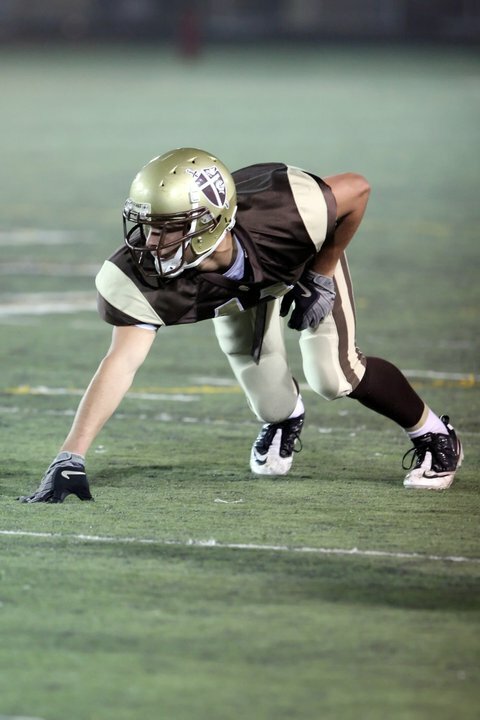 For the second week in a row, the Golden Knights entered Friedman Field with the opportunity to knock off a top-ranked league opponent and control their destiny in the Mission League. After a sluggish start and a furious comeback, the Golden Knights’ last-minute potential winning drive was halted by the Eagles’ defense with 16 seconds left. Two early touchdowns and a two-point conversion put the Eagles on top 15-0 at the end of the first quarter. An Ian Sternau field goal put St. Francis on the board with four minutes left in the second quarter, but Chaminade would tack on another touchdown to make the score 22-3. Quarterback Brett Nelson would once again chip away at the lead with a nine yard touchdown pass to receiver Travis Talianko to send the Golden Knights into the half with a manageable 12 point deficit. Fullback Luke Anderson would punch in a two yard touchdown to make it a one possession game and a touchdown pass to a wide open Talianko gave the Golden Knights a 23-22 lead. An interception by defensive end Michael Singelyn put the Knights well within Eagle’s territory with a chance to widen their lead, but all they could manage was a 34 yard Sternau field goal. The Knights entered the fourth quarter with a 26-22 lead and a newfound confidence against the highly ranked Eagles. Both defenses held strong before Chaminade got the ball with three minutes remaining on their own 27 yard line. With under a minute left, the Eagles capped off their game winning drive with the go-ahead touchdown. St. Francis had one last opportunity, but the Knights turned the ball over on downs to essentially finish the game. The Golden Knights scored 23 unanswered points and had Chaminade on the brink of defeat, but it wasn’t enough to upset the favored Eagles. Mission League leaders Gardena Serra and Chaminade are now undefeated and ranked amongst the top-25 southland football teams, according to the Los Angeles Times. St. Francis falls to 3-4 after a promising start and heads into the middle of their league season with an 0-2 league record. The Golden Knights host St. Paul next week for the homecoming game and the final home game of the regular season at 7:00.